This wine was produced exclusively for WTSO by Nicolo Incisa della Rocchetta; part of the same winemaking team responsible for bringing you Tenuta San Guido’s Sassicaia. Thanks to a recommendation from our friend Mitch who was with Chris and I in Tuscany, we drank a glass of Sassicaia. I have to say it is one of the best Italian wines I had the opportunity of drinking to date. I was intrigued by the email from WTSO so I logged in and bought the three bottle requirement for free shipping. February behind us was noted as one of the coldest on record. March started out like a lamb but a few days in we were hit with another snow storm leaving us with another ten inches of snow. Chris and I plowed and shoveled the driveway making a path to the house two times! I also had to shovel the back deck, which is pretty sizable at over 900 square feet. Once finished I was tired and knew the next day I was going to be a little sore. I to enjoy a glass of wine before we ate dinner. 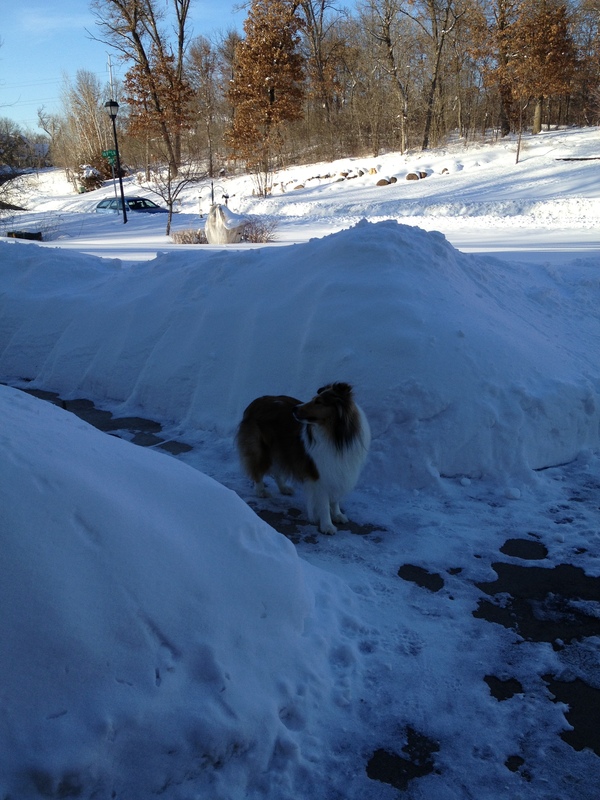 Simba our Sheltie standing by a four foot show pile! Wandering down the the cellar I was interested in opening something different, but good! After pulling a couple of bottles I decided I wanted an Italian wine. I grabbed a bottle of the 2010 Fertuna Droppello Maremma Toscana and headed back to the kitchen. Recalling how wonderful the Sassicia tasted last fall, I was hoping this bottle too was going to be a gem. By this point Chris had begun preparing dinner. We were having Mahi Mahi and vegetables within an Indian green curry sauce on top of rice. The rice cooks for forty five minutes and I admit that I was a bit whinny, not wanting to wait that long! Sorry Chris! While we waited for the rice I filled my time by pulling the cork and rate the Fertuna Droppello Maremma red wine. Color depth was medium with a nice garnet hue. The aroma was moderate and the wine smelled young, but fruity and slightly earthy. I noted spice, ripe red fruit, vanilla and maybe a little tobacco. The wine was dry. It was medium bodied and slightly tart with medium but soft tannins. The flavor intensity was just “OK”, but I didn’t think it was big and it really wasn’t all that good. As far as flavors went, nothing jumped out but ripe red fruit as it was pretty balanced. Don’t misunderstand me, it was a pretty good wine but I was hoping and expecting comparable to the Sassicai red wine. 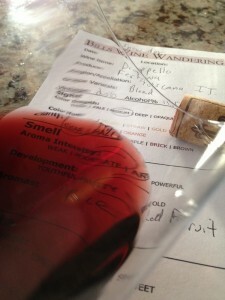 The winemakers blend was Sangiovese, Cabernet Sauvignon, Merlot. 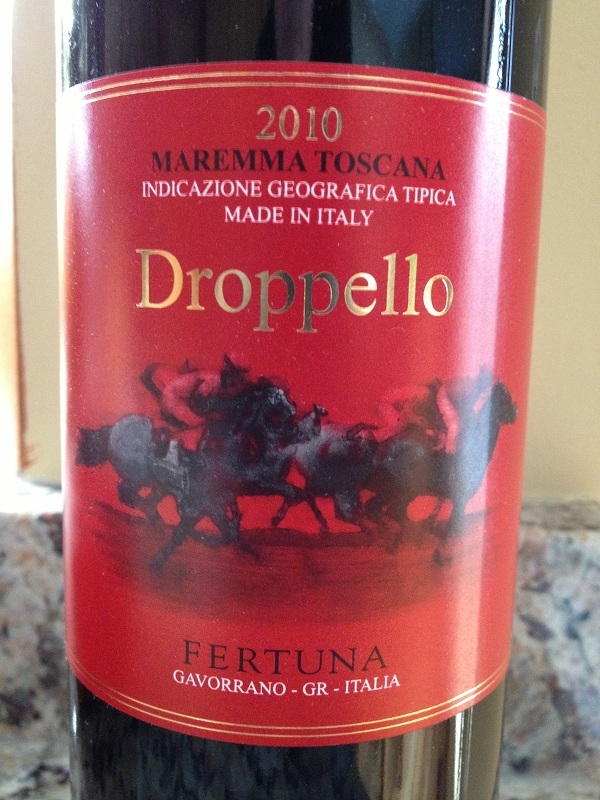 I rated the 2010 Fertuna Droppello Maremma two glasses. I do believe the second glass was better with our meal. I woke up the next day feeling really good and without sore muscles. I hear another storm is on its way, which will be here on Saturday. We hope it misses us!